Earlier this year the food writer Cheryl Lu-Lien Tan stumbled across an article in the Boston Globe describing a trove of digitized documents from Ernest Hemingway's home in Cuba that were recently donated to the John F. Kennedy Presidential Library and Museum, home of Hemingway's personal archives. One line in the article caught her eye: "And the more mundane, like his instructions to the household staff, including how to prepare his hamburgers: ground beef, onions, garlic, India relish, and capers, cooked so the edges were crispy but the center red and juicy." Tan, a Hemingway fan and the author of A Tiger in the Kitchen: A Memoir of Food and Family, set out to find the recipe and try it. She reported her experiences this week on the Paris Review Daily blog. "I had made burgers before, countless times on countless evenings," Tan writes. "This one was different; I wasn't making just any burger -- I was attempting to recreate Hemingway's hamburger. And it had to be just right." Spice Islands stopped making Mei Yen Powder several years ago, according to Tan. You can recreate it, she says, by mixing nine parts salt, nine parts sugar and two parts MSG. "If a recipe calls for 1 teaspoon of Mei Yen Powder," she writes, "use 2/3 tsp of the dry recipe (above) mixed with 1/8 tsp of soy sauce." Hemingway's widow, Mary, published the same basic recipe in 1966 in the sixth volume of the Woman's Day Encyclopedia of Cookery. The one-pound of beef was intended for only two servings. 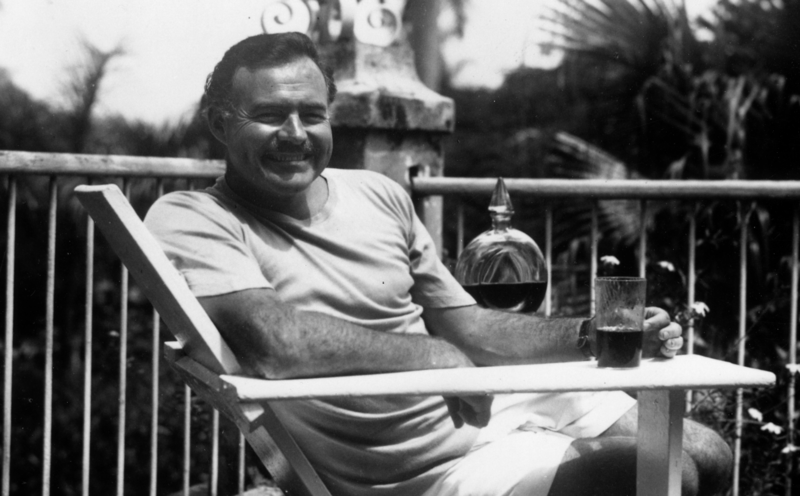 For more on Hemingway's hamburger recipe and his culinary tastes, including a fascinating list of gourmet foods he had shipped from New York to his home in Cuba, be sure to read Tan's article at the Paris Review. Update: You can also now enjoy Ernest Hemingway’s Summer Camping Recipes. Photo: Ernest Hemingway Collection, John F. Kennedy Presidential Library and Museum, Boston. Sounds like you’re overthinking the recipe. This is like taking Queen Radegunde’s bread, and thinking, well, it couldn’t have been just salt and flour and water and honey. No, it’s got to have been farro, and she could have added some spice, or some herbs, and well, it might have leavened of its own, and…and all of a sudden, you get the flavor, not of the Dark Ages, but of our own neurotic times. nnnnWhen a Roman recipe asks me for “juice of sweet grapes”, I use the sweetest grapes I can find, confident that the same cook might well have liked Welch’s grape juice if they’d had it. But again, I don’t look at it and say, let’s throw in a marinade, ’cause these Romans would have marinated everything. nnnnAbout all he asks for is some nice toppings, and that he doesn’t mind some E. coli in the quest for a good juicy burger. nnnnConsider your historical cook licence revoked. What? Who is this addressed to? The author didn’t create this recipe. Hemingway did. When I read through the ingredients and the instructions, this recipe seems very much like a recipe I used many years ago for “ground beef sirloin chateaubriand”. It cooked up like a glorified meat loaf, served with a sauce glaze over toast, and was delicious. You made a recipe that was beyond complex, when Hemingway’s was quite simple. That said, your homage recipe is probably delicious. And so probably is Hemingway’s burger. Still, two distinct recipes. It’s two and a half years later, but the fact that you’re thicker than a whale omelette rings across the ages. This *is* Hemingway’s recipe, you dimwit. There’s a scan of it here: http://www.bbc.com/news/blogs-magazine-monitor-26160596. It’s a word for word match for the one above.